Back and neck pain can ruin your game. I have laid out some simple strategies to prevent golf injuries with little effort. There is no one-size-fits-all solution, but here are the first things I tell all my golf clients so they can play 18 without pain. Golfers are prone to back pain and neck pain due to the high torque and repetitive nature of the swing. 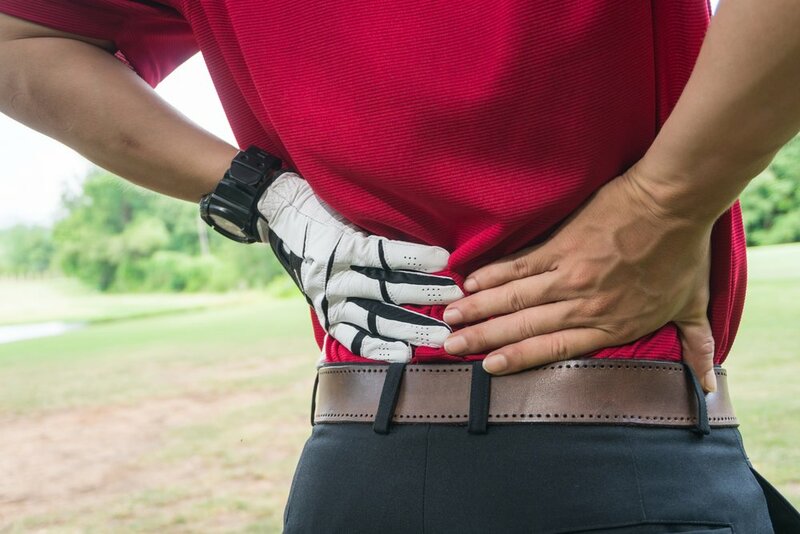 As a result, golfers often experience back pain suddenly during playing or excessive soreness afterwards. Preventing golf injuries can be a simple process if approached methodically and with the right guidance. Keep in mind that the cause of back pain in an individual can stem from a number of factors including: flexibility, strength, body type, and training. If you are experiencing back or neck pain, you should consult a medical professional immediately - it could be serious, and if not, many symptoms can be managed easily if treatment is performed shortly after injury. Stretch and foam roll in your free time off the course. There is no substitute for mobility work that is performed throughout the day. I recommend 3-4 bouts of 5-6 minutes of stretching throughout the day, focusing on hamstrings, hip flexors, and lats. Foam rolling the TFL (a hip flexor) is a game-changer. Don't skip the warm up. This seems obvious, but most of us show up to the first tee and hit a couple right out of the car. Do this enough and you will get injured. A proper warm-up includes pre-swing mobility drills followed by a good progression from half-swing wedges to full swings to long irons and woods. Get a routine on the box. Don't waste time watching your partner's slice - instead spend the time focusing on your turn, hip mobility, and balance. If you walk, you are at an advantage. For the riders, you should get moving out of the cart before you swing. Train for golf. Resistance training programs have a huge impact on golf performance and injury prevention. Just like professional athletes need cross-training, so do amateur golfers. Get in with a fitness pro and dial in a program specifically for golf.